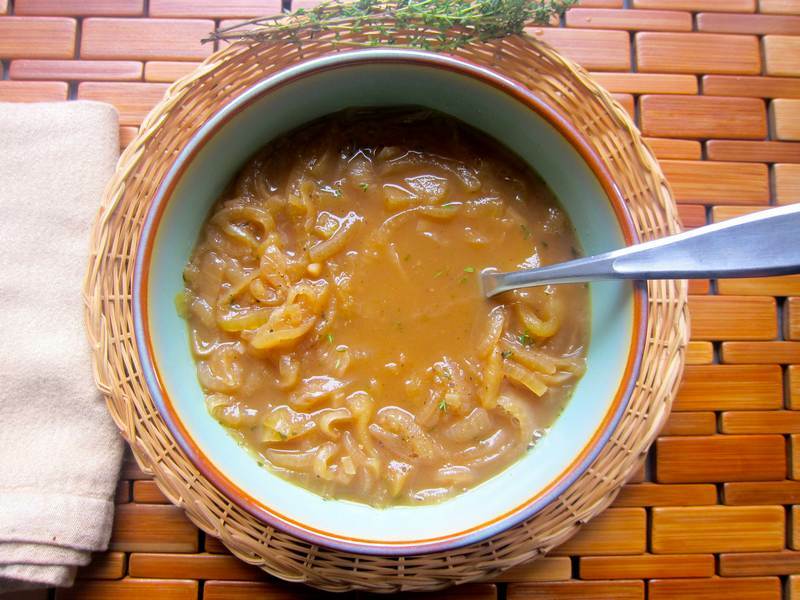 Apple Onion Soup with Thyme – Divine! “A” is for apple and perfect marks—apples are perfect fruits for caramelizing alongside onions. Coincidence? I think not. If you want to try a lighter onion soup than the traditional French variety, this one will thrill your tastebuds. If you want traditional French onion soup with a twist, cover the crisped bread on your Apple Onion Soup with Thyme with this Canadian cheese named best in the world. Heat oil in a large pot over medium-high heat. Add onion, apples and salt. Cook, stirring often, for about 20 minutes, until onions and apples are well caramelized. Stir in broth, wine, thyme, pepper and bay leaf. Bring to a boil and scrape the bottom of the pot with a wooden spoon. Simmer for 20 minutes. Discard bay leaf and adjust seasoning. Sprinkle on a few thyme leaves before serving. Serves 8. 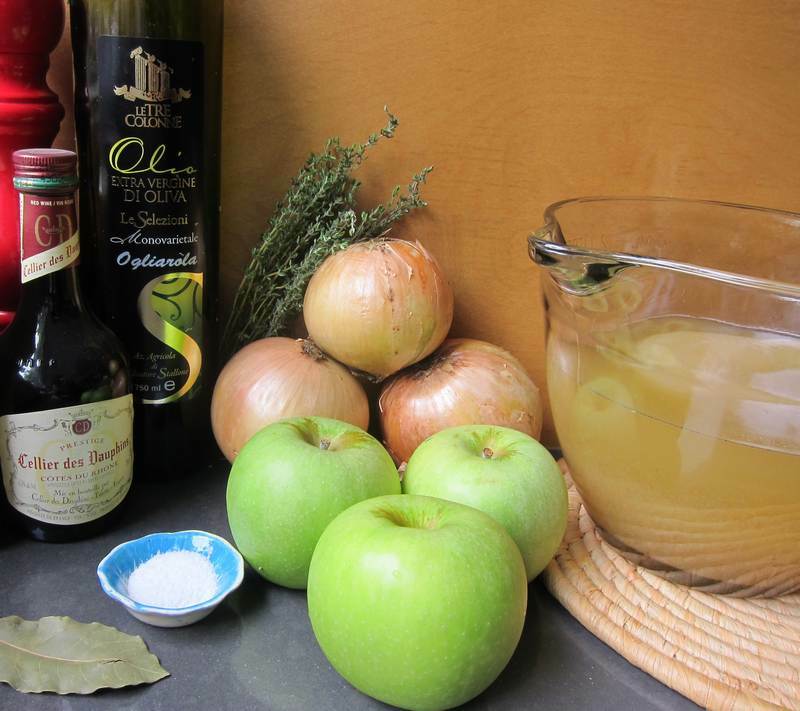 Thanks to my gourmet foodie friend, Susan Kasner, for sharing the Apple Onion Soup recipe that she discovered in Leite’s Culinaria. Apple Onion Soup with Thyme reminds me of an old jovial acquaintance in the wholesale fruit and vegetable world, Moe Fleishman, who ate onions like they were apples. According to modern science, he may have been onto something. Want to know where to find the cheese named the best in the world? I’ve been sneaking miso into all sorts of recipes lately and loving the flavour. If you love salt like I do, but don’t want the health risk, consider the fact that the strong salt flavour in miso is deemed OK.
Have you seen these 3 easy-to-make soup recipes? One of them is a Miso Soup. Thanks Darya. I knew I could count on Susan to pass on a great tasting recipe. Nothing beats being reblogged! Thanks!!! Jittery cook has loads of veggie recipes. Enter salad or whatever veggie you feel like eating in the search box for good, low cal, healthy recipes. Never thought to add apple to onion soup. A great idea I will have to try. I can’t get enough of unusual new food combinations. It is so much fun experimenting and seeing what tastes great. Thanks for reblogging! All this reblogging makes my day!! WOW – Magnificent!!! The pleasure is mine! sounds delish…i think i’m going to make it tomorrow! yummo! perfect for this cool fall weather. Thanks for liking Cathyo! Let me know how it goes. Sounds good from down under. Nice! Hope to get back down under someday soon! Care to share any down under wonders? Recipes of course. There’s something irresistible about anything made with caramelized onions. You have a knack for taking a good recipe and making it better – can’t wait to try your version! It won’t be better than yours! Are you suppose to cover the pot when caramelizing? Or add water? I’ve read about different ways of doing it and I never get it right. Maybe I’m not patient enough? There are many ways. I say uncovered. I’ve read that we shouldn’t stir much but I stirred and it was fine. The bottom is supposed to crust up a little and you use a wooden spoon to blend the crust into the stock. It is a super tasty soup!!! Very different and fresh tasting compared to the usual onion soup which I love too.